Dani McVety, DVM, is the co-founder and CEO of Lap of Love Veterinary Hospice. Through Lap of Love she does in-home end-of-life care, providing the most peaceful end-of-life experience for pets, and the people that love them. 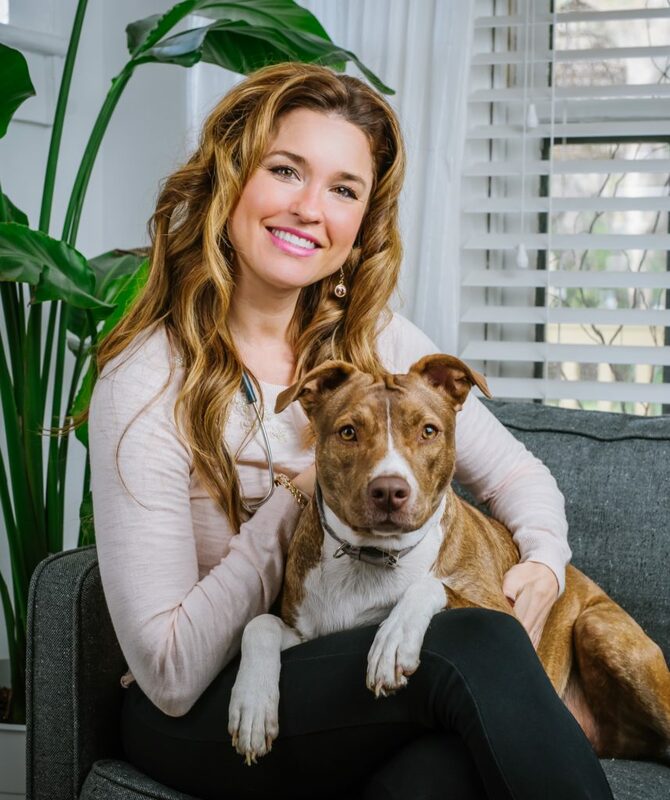 Goodnewsforpets recently caught up with Dani McVety, DVM at CVC Kansas City to chat, following up on our feature from earlier this year when she spoke during the APPA’s Professional Women’s Network Breakfast at Global Pet Expo. How did you get started working with end-of-life veterinary care? What sparked your interest? My interest in end-of-life care really started when I was in emergency practice. When I graduated, I began doing emergency room work. I loved the adrenalin that comes with that type of work. I love helping people when they feel really helpless. I began finding myself gravitating towards the end-of-life cases, and my team would come grab me for them, those difficult ones. I found a fulfillment in helping people through a compassionate end-of-life experience that you don’t always get when you’re in the OR for hours. A lot of our families expect us to stay for their pet’s life, but when we help them through that worst moment with compassion and empathy, it’s really a fulfilling experience. Dani McVety, DVM and her American Hairless Terrier, Secco. Your first lesson at CVC Kansas City is about “Body language for the veterinary team”, Can you tell us why it’s so important for veterinarians, especially with the end-of-life care? One little quick tip about body language, just to show you how powerful it is, is the importance of your stance. How I stand shows you about the confidence that I have, and whether or not, I am a good enough doctor to handle your pet, and whether or not I’m a good enough support team to actually help you through the process of going back and taking your pet, either through an end-of-life experience, and/or simply just a spay or neuter. If you can control your body language and how we non-verbally communicate to someone, we can gain that rapport. Tell us about your experience speaking at CVC Kansas City, and what is it that just really interests you about the conference? Being invited to speak anywhere is such a huge honor. I actually tell my human kids all the time, “People actually come to hear me talk sometimes.” It’s really a big honor. The CVC has always been really special to me because I love Virginia Beach, and I love Kansas City, and of course, San Diego, as well. Actually, I don’t know what it is with the energy, but there’s always just a very happy, positive, pure energy that comes with the CVC. The exhibit hall is amazing, the team is absolutely incredible. It’s not just about the science. Very heavy in science, but it’s also about the soft skills that make our profession who we are. We are the pediatricians of our nation now. We care for that human animal bond in different ways, we have to be open to the different ways that we all are doing things throughout the entire veterinary space. It’s really awesome to see that holistic approach the CVC has towards the veterinary profession, and what we’re all doing. You’re involved with speaking in different universities across the US. Can you tell us, what’s the most interesting aspect about working with young millennials in the veterinary profession? I’m on the admissions board of the University of Florida College of Veterinary Medicine, and by the end of this year, I will be speaking to about 22 of the 30 veterinary schools that are in the United States. It’s really an incredible and very privileged perspective that I have when they ask me to talk. I had a very unique path to veterinary school. I actually graduated in the part of the class that makes the top 90 percent possible. I’m actually at the top end of this millennial time, being 35 myself. They’re impatient. They want this information. They want it soon. And, they really want to do the very best. They also want the type of mentors that are going to help them through that. I don’t believe that anything is different than the way it’s ever been. It’s literally about us being able to treat people the way that they want to be treated, and that garners the best end result for an entire profession. I absolutely love the students. It’s something that my entire team knows I would drop everything just to go and meet with the students, because it’s so important for me to set these very young adults up for success. You are a veterinarian, author, and consultant. Can you just tell us a little bit about what keeps you pushing to have all these accomplishments in the veterinary field? I had a rough patch through veterinary school, just trying to stay in vet school. I didn’t get the first job that I wanted. I developed a business when people said that there’s no way that it could have happened. These things happen in your life. There’s many other obstacles. To sit back at the end of the day and say, “You know what? I believe that I am very, very blessed, and I believe that things always work out for me, and I believe that I can love my job, and I believe that I can treat people and their patients in an amazing way, even if they don’t feel that it’s perfect, right?” At the end of the day, it’s not just about those interactions. It’s not just about saving a pet’s life. It’s really about, can you live a life that means something to you? Can you live a life of passion? It’s about being a mother, being a spouse, or it’s being a practitioner, if it’s being a business leader right now. I’m an entrepreneur, and being an entrepreneur is much different than being the head of a company that’s growing quickly. But, if I can do everything that I’m doing with passion and with commitment to making the experience for people around me as good as it can be, then I feel like I’m on purpose in my life. So, that’s what drives me every single day, is just the passion for life. And it should be in every part of what we do. When I talk to consumers, one of the things that I love to tell them about the veterinary profession is how hard we work to become veterinarians, and how much we really do care. We’re humans. And if you find a veterinarian that you really connect with, then that’s the one that you should use. And if you have one that you don’t connect with, then find one that you do, because we’re not all one-size-fits-all. There’s thousands of doctors here that are learning new things, because there isn’t one manual that makes everything perfect in medicine. If you just constantly look for that connection with your veterinarian that you love, you’re really going to have that person that treats that bond with your pet the way that you want them to treat it. I bet every single one of us has a veterinarian that inspired us to be here, and/or a pet that actually inspired us to stand for that bond that other people have with their pets. So, reminding us constantly, every single day, about why we’re here. Even our team at Lap of Love. Everyone has two pictures on their desk – a picture of their family, or friend, or spouse, or best friend, and a picture of their pet. Because we always know that we’re talking family and friends, and the pets that mean something to us. I hope we’re always reminded about that, every single day, the passion that we started with in this profession. Connect with Dani McVety on social media!